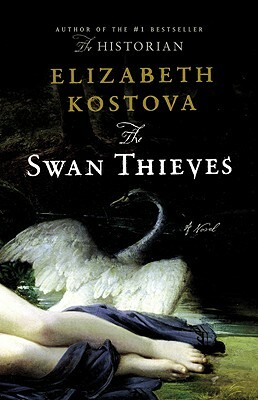 564 pages is a lot to ask of a reader, and unfortunately, ask turns to beg in Elizabeth Kostova’s latest novel The Swan Thieves. Known for her bestselling debut work The Historian, I’m afraid Ms.Kostova won’t win any converts from those introduced to her work through this latest doorstopper. Using voice as her palette, Kostova employs alternating narratives and their respective dialogue to frame the mystery surrounding famed painter and tortured artist Robert Oliver. Having recently attacked a painting at the The National Gallery of Art, the renowned Oliver finds himself placed under the residential care of psychiatrist Andrew Marlow. Arriving with little more than a stack of letters among his things, it is this mysterious bundle of antiquated correspondence that ultimately serves to nudge the story. With its drawn-out detail and long-winded narrative, I’m afraid The Swan Thieves overextends. As it fluctuates between the voice of Dr. Marlow and that of 19th century artist Beatrice de Clerval, the reader is pulled along a flat and plodding journey covering both continent and coast. Sadly, Kostova’s attempts at eloquence collapse under the weight of her own words, and eventually move to kick out the legs of the story. Despite such reader frustration, Ms. Kostova’s considerable passages on French Impressionism, art history, color subtleties and portrait execution are nuanced and informative. As they weave through the novel’s entirety, Thieves will at the very least put those not versed in the finer arts of portraiture and art genre upon higher ground. Nonetheless, as readers well know what works for one book doesn’t always work for another, and I suspect the literary devices used to bring The Historian such acclaim simply didn’t work this time around. Though The Swan Thieves has heart, its pulse would have beat more with much less. *Support your local bookstores and universities. It matters!